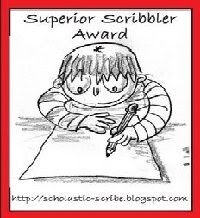 So the rules every Superior Scribbler will name 5 other Super Scribblers. If you are named you must link to the author & the name of the blog that gave you the award. Then you must display the adorable award and link to This Post, which explains The Award. Finally you must visit this post and tell your name to Mr. Linky List. Then they will have a record of all the people who are Super Scribblers! Thanks Little Prince. I will get down to the scribble! hehehe! I got the same award for you.